Coll. No. 1289, 8 Sep 2015, characters observed: Shrub, to 30 cm. ; Leaves, cauline, alternate, 27 mm. × 0.8 mm. wide, linear; Inflorescence, many subsessile heads in flat-topped clusters; Involucre, 4 mm. × 1.5 mm. wide, obconic; Phyllaries, 2+ series (very waxy and difficult to dissect cleanly); Receptacle, epaleate; Flowers of 2 kinds; Rays, #6-7, fertile, corolla, 3.5 mm., yellow; Disk flowers, #2-3, corolla, 2.5 mm., yellow; Pappus, scales; Cypsela, 0.8 mm. Field Notes: Coll. No. 1289, 9 Sep 2015. 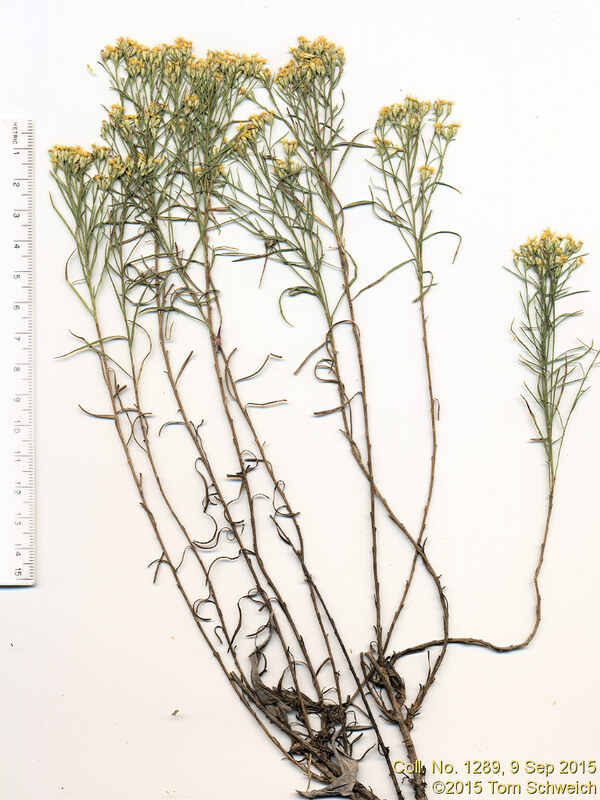 Other photos about Species - Asteraceae or Gutierrezia sarothrae.